First thing this morning I found myself in the vicinity of Kings Cross after a meeting. The area of Kings Cross isn't very high on London's list of tourist attractions. Although recent regeneration has changed the face of the area quite a lot is still a bit run down and shabby, and the whole area still has a reputation as a red light district. At the centre of this area are the 'twin' stations know by Londoners as Kings-Cross-St-Pancras. These are actually two stations which sit next to each other. St Pancras has recently been transformed as at the end of last year it took over the role as London Terminus for Eurostar services (previously a role held by Waterloo Station) and the correct title of the station is now St Pancras International. The initial most impressive thing about St Pancras station is the amazing Victorian Gothic architecture on the front of the station. At one time the Midland Grand Hotel this building then became St Pancras Chambers and served as office space. After falling into disuse at one time it was slated for demolition, and was saved by being awarded Grade I listed status. Thanks largely (I would imagine) to the new international rail terminus the frontage is now being returned to its former hotel status. Inside the station is probably just as impressive as the outside of the station. At the time it was built it was the largest enclosed space and the largest single span. An interesting side note (for me) is that the man who designed it William Henry Barlow was born in my very own Charlton! Platform level looking through the security area to the Eurostar trains. This statue is entitled 'The Meeting Place' and stands under the station clock. You don't really get a feel for the size of it here, but it is apparently 30ft high (and cost £1m!). This shows the lower level of the station (so that's where all the people went!). Where there are all the facilities that you would normally associate with a station. These are some of the original features of the Victorian Station, showing the bottom of one of the supporting arches and the ticket office. Some more fantastic Victorian Gothic architecture, taking you back out of the front of the station. The amazing vaulted ceiling of the station, just visible on the left the station clock. Next to St Pancras the front of Kings Cross is nowhere near as impressive. The original station has been obscured by a 'temporary' extension (which is due to be demolished at some point during the regeneration of the area). Looking from the front there is no indication that another beautiful Victorian station is behind! 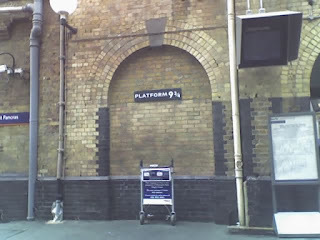 Kings Cross is famous these days for Platform Nine and Three Quarters, which fans of Harry Potter will know is from whence the Hogwarts Express departs. Kings Cross Station does indeed have eleven platforms, however, sadly, Platforms 9 and 10 (and indeed 11) aren't in the beautiful main station area but a rather less impressive side extension. There is a rather incongruous monument to the mythical platform as you walk between the sections of the station. The trolley hasn't been abandoned by a frustrated traveller but is, on closer inspection, part of the 'art' being positioned half-in and half-out of the wall on the way to the 'hidden' platform!